When Was John Crane Wounded? A Myth in the Making in Framingham? 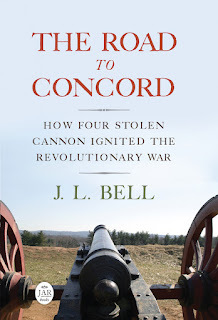 John Leach and the "Aides-de-Diable"
Most histories of the American Revolution mention only one event from July 1775: the arrival of Gen. George Washington in Cambridge, where he assumed command of what at the same time became the Continental Army. The lithograph to the left, from 1876, reflects that view of the new commander’s importance. Boston 1775 has had little to say about Washington this July, however. That’s because the new general’s arrival in Massachusetts wasn’t treated as so momentous at the time. In fact, lots of people didn’t even take notice. Here are the entries for that week from the journal of Pvt. Samuel Haws of Wrentham, Massachusetts. the 29. Nothing remarkable this day. the 30. Nothing hapened only there was a Smart shower. the 1. Nothing remarkable this day. the 4. Their was a flag of truce come out of town to our centry on the neck. the 5. Nothing worth a mentioning to day. the 6. Nothing remarkable this day. Washington arrived on 2 July, and formally took command of the army the next morning. In that passage I sense a touch of grumpiness about being kept up on orders of the generalissimo (a word Haws was still learning to spell). I suspect another reason for Haws’s lack of excitement stemmed from how he was stationed in the southern part of the ring around Boston. The officers there tended to act independently of the command in Cambridge. Gen. Ward’s orders would arrive, and the regimental commanders in Roxbury would have a counsel to discuss whether they were ready to sign on to those plans. That attitude might have filtered down to the men. When Haws wrote of “the general” on 14 June, he meant Gen. John Thomas in Roxbury, not Gen. Ward. That loose command structure hadn’t produced any breakdowns yet, largely because the New England militiamen were so united in their goals and outlook. But among the jobs Washington took on were instilling more military discipline and hierarchy in the New England ranks, and integrating those men with troops coming from Virginia, Pennsylvania, and other colonies. Only then was he truly commander-in-chief of the Continental Army.